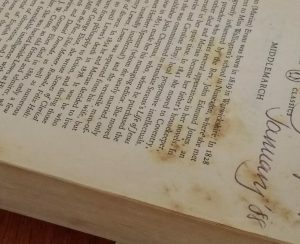 You can see the state of my copy. 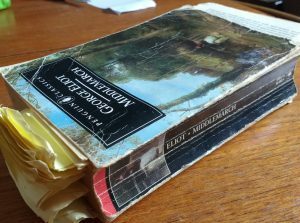 It’s been with me for nearly 30 years now, and would be my desert island book. It is inexhaustably empathic, wise, honest, brave, inspired, inspiring and visionary; it’s also extremely funny at times, when characters’ pretensions and foibles are quietly, devastatingly exposed. It’s full of ideas, full of head as well as heart, and full of the nineteenth century’s grapplings with the doubts and changes consequent on contemporary developments in science and industrialisation. It’s—well. It’s just the greatest novel I know. It is a long read, and does ask a lot of you. But if you can give yourself a bit of a run-up at it, setting aside time to get a good few chapters under your belt during your first sitting, I reckon it will have you. Even the teeny-print paperback Penguin is 896 pages long, so I’m not going to attempt any kind of summary here (no doubt the Lords of Wikipedia can give you some kind of précis); and anyway, that’s not really the point. It’s not just the what of the novel that matters, it’s also the how. All the many characters we meet are drawn with such insight, empathy and kindness, and yet also with honesty; all their lives are shown to be interwoven, so that they affect each other in so many different ways, of which they are more and less aware. And each individual self is seen at once from the inside—what the narrator calls their ‘centre of self’—and also from the outside, too, so that the reader is never allowed simply to sympathise nor to judge. We are obliged, somehow, in the course of the reading, to extend ourselves: to become more clear-sighted yet also more compassionate than we thought we could be. The narrator tells us at one point: ‘if we had a keen vision and feeling of ordinary human life, it would be like hearing the grass grow and the squirrel’s heart beat, and we should die of that roar which lies on the other side of silence’. Middlemarch lets us hear something of that ‘roar’, reminding us that behind every pair of eyes is another story, both different from and similar to our own. And in so doing, it helps us outgrow what Eliot calls our ‘moral stupidity’. We all matter. If you need reminding of that, or convincing, read Middlemarch.